This page is for discussing topics related to the UESP:Elder Scrolls Online Map. Note: The ESO map is currently undergoing heavy development and testing. Not all features are currently enabled or working correctly. Please report any issues below. I already stated what the spoilers are: Skyshard locations, Lorebook locations, and treasure chest locations. I enjoy solving the clues for Skyshard locations, I enjoy trying to figure out Treasure Map locations, and I enjoy running into Lorebooks as I explore. The UESP Map shows you the exact location of these things. I personally have a good enough memory that accidentally seeing a Skyshard on the map means that I will still remember where it is a week later when I happen to be in the right area in the game to pick it up. This spoils my enjoyment of solving the clues. It's not really the same as being told the storyline of a quest because a person consciously chooses to click on the page describing that quest. Whereas these spoilers are out in the open and unavoidable - except by avoiding the UESP Map. Which I'm sure you'd agree is a bad thing - we want traffic to come to this wiki in preference to others. Generally situations such as "I'm pretty sure I've filled in the whole map but I've only found 5 out of 6 delves - where's the other one?". Or "Hmm, there's a massive space in the centre of the map - is it just a big mountain, or is there a location hiding in the middle?". Situations when you don't want to waste time traipsing all over the zone looking for something. Hey guys, I can't edit the map, but the link on the Rivenspire map for M'aiq the Liar isn't working, it redirects to http://www.uesp.net/wiki/Online:Http://www.uesp.net/w/index.php which definitely is not M'aiq's page. I haven't found any other broken links aside from this one thus far but I don't use the map that often unless I'm looking for anchors. If someone could fix it, because I can't seem to (might be a privilege issue with my account, also might be Firefox beta not playing nice with the code here) that would be great. Sorry for causing problems my first time posting on here instead of helping to fix other ones, however I broke the Craglorn link and sub-area portion's of the map such that its no longer available to the end-user. Some of the standards for display levels are not consistent with the current map or should be changed to make it more useful. The most notable one is marking resource nodes at level 11. From my experience with the map, there are no resources shown. Adding these markers is a futile task and would only serve to clutter things. If anyone needed to see where resources were, they would likely use an add-on such as HarvestMap. Another inconsistency and clutter issue is with lorebooks. The standard says place them at level 10, but the auto-fill default is 11. I've been changing them to level 10, but noticed that it detracts from other points of interest that display at that level like skyshards. Eidetic memory is similar and already at level 11, except for the 36 Lessons of Vivec, which are more like quest objectives. As a side note, it isn't made clear how the description for lorebooks should be formatted. I saw several styles like "Lorebook: [Collection]" and "Lorebook, [Collection]" and think the first option is best. Most of the existing lorebooks don't even have names yet, so this will be an ongoing effort. Remove standard for resource nodes and possibly mention that they should not be marked. Move lorebooks to level 11 and specify the format "Lorebook: [Collection]" as the standard description. Add 36 Lessons of Vivec to level 10 list. Add-ons are no good for consoles, and I have yet to see any other online resource which marks the locations of nodes. We do have some on the map already, but not many (map). The Lorebook standard says 10 because that was the original unopposed proposal by Jeancey, but if it does end up being too cluttered at 10, then maybe 11 could be better. Lorebooks are arguably as important as Skyshards though, as both are relevant for skill progression. Specifying the format sounds good. Sure, we can add 36 Lessons to the list for Level 10. I also want to chime in and say lorebooks are perfect at level 10. Skyshards and lorebooks are the two things I go out of my way to collect when I'm roaming around, and it's important (for my purposes at least) that they're visible at a higher level on the map so I can see where they are over a wide area and plot my route accordingly. I would prefer that they stay at their current level. All right, it sounds like lorebooks should stay at level 10. For consistency, we should change the auto-fill default to that as well (currently 11). I still think resource nodes are largely a waste of time, but if they are eventually added, I'd recommend waiting until everything else is finished. The ones Enodoc linked need updating anyway to reflect how the material type changes with character level and skill. Change auto-fill default for lorebooks to 10. Specify the format "Lorebook: [Collection]" as the standard description. The filter also persists through different maps. If the item doesn't exist on a given map, all icons will be shown along with a message stating "Item not found". It uses jQuery and jQuery Cookie (this protects the filter against dragging/map changes). The code can be viewed here: here. It would be great to hear what you think, and if everyone's happy with the idea, it would be great to have this feature go live. Very minor. But annoying after a while. 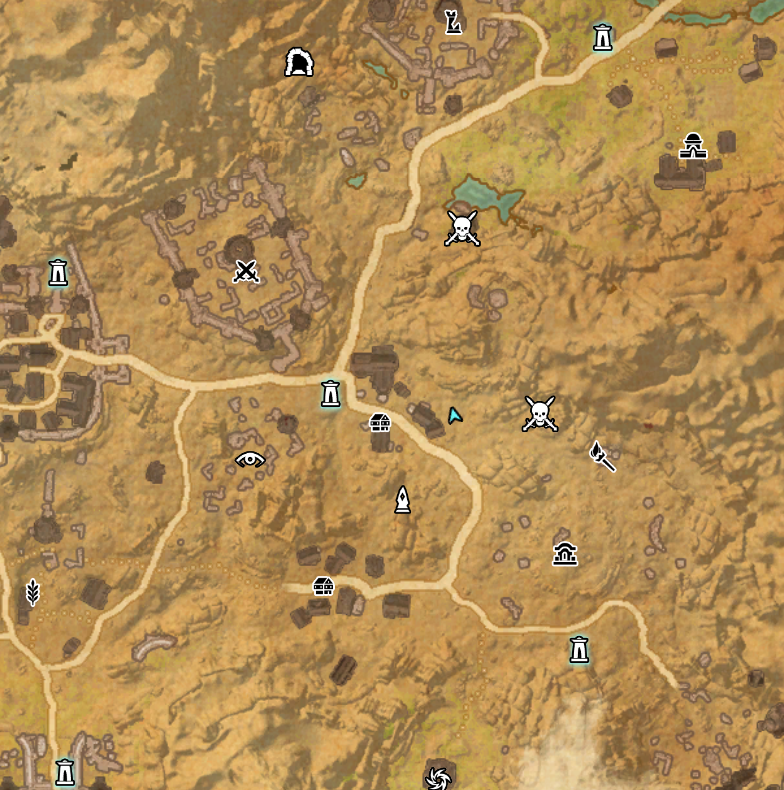 New permissions were added to the ESO map so that only those with the cartographer role can edit it. This is how the other maps work for Morrowind, Oblivion, and Skyrim. The map software is very limited when it comes to viewing changes and reverting bad changes, in particular deletions. The main reason for the new permissions is to avoid large-scale deletions that would seriously damage the map and require many map link edits on the wiki to correct. In several areas, especially those in DC, most of the lorebook names are missing. Search for example lorebooks in Alik'r, they are all called 'Lorebook' except one. This page was last modified on 26 January 2019, at 14:20.